I am not going to lie, I was a bit shocked when I first read about this news. But now that it has sunk in, I am quite excited about the changes going on with 10 Barrel. Our favorite local’s night and happy hour at Bend Brewing Company (BBC), is about to go through some major changes as well , and this was probably the most surprising part to me. 10 Barrel has hired some new Brewmasters, and one of them is Tonya Cornett, currently Head Brewmaster at BBC. This change for Tonya, will formally take place mid-summer 2011 by the sounds of it. 10 Barrel also hired longtime Deschutes brewer, Jimmy Seifert, to assume the brewmaster duties at 10 Barrel. Seifert has just started this month. So we are excited to taste some new beers from 10 Barrel and know that we will keep you updated on what we like. To read more about these changes, visit The Source Weekly’s Article, or Hack Bend’s Blog for more information. Congratulations to Tonya, Jimmy and to 10 Barrel Brewing! So we have finally finished our Bend Ale Trail trip and so excited to share it with you! What a fun thing to do, we highly recommend it whether you live in the area, or are just traveling through. We also recommend biking the trail or calling John Flannery of the GETIT Shuttle (also known as Green Energy Transportation) at (541) 610-6103. 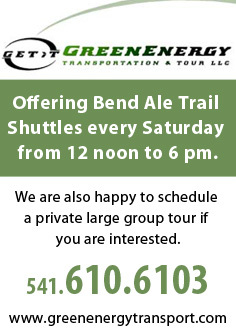 They offer Bend Ale Trail tours every Saturday and are happy to schedule a private large group tour if you are interested. We started our trail with a stop at the downtown Visit Bend office where we found out more information, picked up our maps and got to see the silly pint which we now are so excited to have! We also left some of our Bend Beer Blog rating cards with them, so be sure to pick some up so you can rate the beers you try while on your own Bend Ale Trail trip. Then make sure to come back to our site and let us know what you thought of the beer and the Bend Ale Trail. From there we headed out to the “extra credit brewery,” Three Creeks Brewing. We absolutely loved it! The ambiance is wonderful, service was great, food was yummy and the beer was pretty good too. Our favorite beer here was the Old Prospector Pale Ale. We then headed back to Bend, got on our bikes and headed to Cascade Lakes Brewery. We each had an IPA while sitting outside on their patio and it was so refreshing after the bike ride in the heat to get there! We also had to check out their cool car with the Blonde Bombshell logo on the side (see photos below) while riding out to our next stop, 10 Barrel Brewing. Here we had their Apocalypse IPA at their outside bar. We had recently tried all of their beers on a sampler tray and the Apocalypse IPA was the winner by far so we stuck with that. I do want to mention that we think they did a great job designing this brewery and we love the outdoor seating areas. Back to biking, we rode across town to the Silver Moon Brewery off Greenwood Ave., where we sampled a few more beers and then ordered the Hop Knob IPA. We also had a few bites to eat from their appetizer menu. We usually enjoy the live music here at Silver Moon but stopped in too early to take part this evening but still had a great time tasting. Our next stop was Bend Brewing where we always hope to have the Hop Head. Unfortunately, it was still unavailable so we tried the Red which was great, just not the Hop Head. We enjoy BBC and you can almost always find us here on Local’s Night every Tuesday. We then decided to call it a day but don’t worry, we picked it right back up the following day at McMenamins where we enjoyed the patio seating, cajun tots of course and then some fun mixing beers…I mean where else can you mix a Ruby and and IPA? Well I did just this and it was pretty great on that hot afternoon. We also tried several of their other beers and had a great time. Next we stopped in to Deschutes Brewery. As usual, there was an hour wait to be seated so what better way to spend that time…order a beer! Once sat, we tried some of their seasonal brews which is always fun at Deschutes. We have also done their brewery tour off Simpson Ave. and highly recommend it. Last and most definitely not least, we made a special stop at Boneyard a few weeks later. This brewery has some great beer to try and we highly recommend their Pale Ale! If you cannot tell by now, we love the hoppy beers and this pale ale is outstanding! The tasting room was small but the brewers were friendly and we had a great time. We also want to say that Wednesdays are a great day to stop by Boneyard for their $6 growler refills. We are glad that Boneyard is here! This completes the Bend Ale Trail for us, we are now proud owners of the Silipint! What a great cup for the beer drinkers on the go like us! Make sure to stop into the Visit Bend office to pick up your map when you start the trail, and then once again when you are finished to pick up your own silipint. We look forward to seeing all of you on the trail and make sure to come back to our site and rate the beer you try!